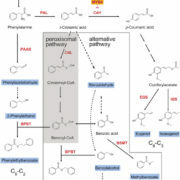 Zhang et al. 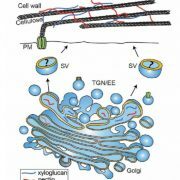 investigate the assembly of a molecular motor that produces cellular ATP in chloroplasts https://doi.org/10.1105/tpc.18.00075. 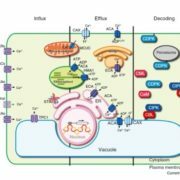 Background: The F-type ATP synthase produces nearly all of the cellular ATP, the universal energy currency required for the biochemical reactions in living cells. This enzyme is one of the world’s smallest and most sophisticated molecular motors and has promising applications in nanomedicine-based synthetic biology. The F-type ATP synthase comprises two rotary motors, F1 and Fo. The F1 module is a hydrophilic unit that catalyzes ATP formation or hydrolysis and is composed of five different nuclear- and plastid- encoded subunits with different stoichiometries. However, it is unclear how these subunits assemble to form an active ATP synthase. Question: We wanted to investigate the assembly process of chloroplast ATP synthase. 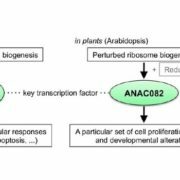 We therefore isolated mutants of Arabidopsis thaliana that accumulated reduced amounts of chloroplast ATP synthase. Then, we investigated which step was affected in the ATP synthase assembly pathway in the mutants. Findings: We found that, in the chloroplast ATP synthase mutant bfa1, the assembly of the F1 module is impaired. 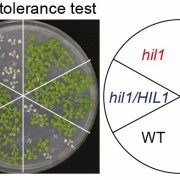 The gene affected in bfa1 encodes the BFA1 protein, which is localized in the chloroplast stroma. BFA1 interacts transiently with the β, γ, and ε subunits. The crystal structure of BFA1 was resolved at 2.8 Å and revealed that BFA1 is composed of two β-barrels. 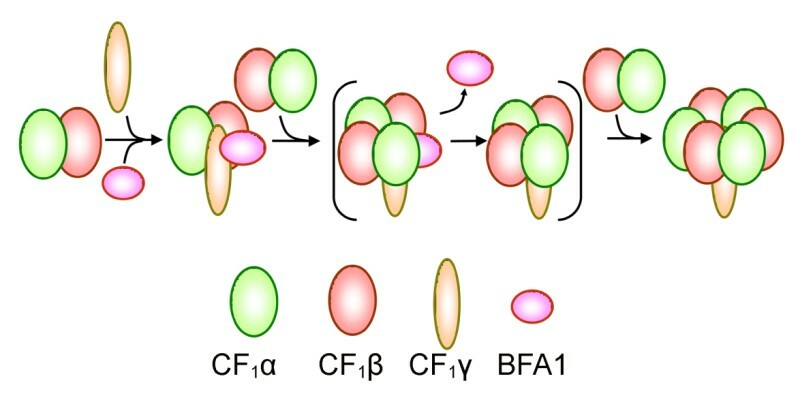 The contact region between BFA1 and β/γ was further mapped by yeast two-hybrid assays. An in silico molecular docking analysis revealed close-fitting contact sites between BFA1 and the F1 module. Based on these results, we propose that BFA1 acts mainly as a scaffold protein promoting the association of an α/β heterodimer with γ. Next steps: We are screening for additional ATP synthase mutants of Arabidopsis to identify new assembly factors for ATP synthase. 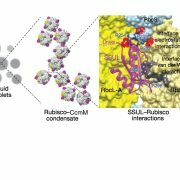 Mutants of this sort will provide new insights into the detailed assembly process of this complex enzyme. Lin Zhang, Hua Pu, Zhikun Duan, Yonghong Li, Bei Liu, Qiqi Zhang, Wenjing Li, Jean-David Rochaix, Lin Liu, Lianwei Peng. (2018). 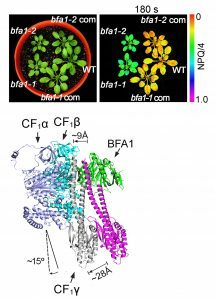 Nucleus-Encoded Protein BFA1 Promotes Efficient Assembly of the Chloroplast ATP Synthase Coupling Factor1. 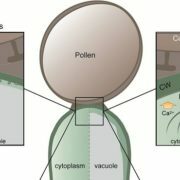 Plant Cell 30: 1770-1788; https://doi.org/10.1105/tpc.18.00075. 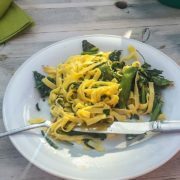 Did a Swedish researcher eat the first CRISPR meal ever served?